WE HAVE CUT OUR LABOR COSTS! IN HALF From 2006 -- CALL! OK already, how much does it cost? We have no "cookie cutter" prices because every job is unique. When you call us you will reach either me, Roxanne Bender directly, or our voicemail or send an e-mail . On our phone visit we will talk about what you want to have. Is it a pond, just the waterfall, a stream, a rebuild, how much or how little maintenance, just the water feature or additional landscaping, etc? When we meet you at your home we will take pre-bid pictures and measurements, show pictures and video of our own work, explain why we do what we do that sets us apart from other pond builders and we will "pick your brain" to see what kind of water feature will fit best in your lifesytle. Our next step is to take this information home for a couple of days (we do have family hours too) and draw up a design similar to a plot plan and figure out the costs exactly. We do not do the mark-ups most contractor's do to cover their... overhead. We work from our home thereby eliminating store-front and employee costs. We are a husband and wife team which means great quality control! We pass these savings on to our customers. Why not!? We like to work and love our job! We Warranty Our Workmanship for as long as we can lift the rocks! We can do this because we do every job as though it is in our own backyard. Below are questions that you, as the consumer, should ask of any pond builder you are considering for this major investment in your home and lifestyle. I will give information about what to watch for as a red flag and our answer! Do you have a Contractor's licence, liability insurance and are you bonded? Do you have references I can call? Every licenced contractor is supposed to carry on him a card with his licence identification. Then you should go to the California State Contractor's website and check them out. If they cannot provide you with a list of satisfied customers... do they have any? You can check us out... we're not scared. Our customers are all happy and offer referrals, recommendations, and repeat business every Spring! We have a perfect record with the Contractor's Board and the BBB. Our bonding company only takes clients with perfect records. Our liability insurance is always up to date. We use contracts approved by the Californis State Contractor's Board. Can you show me pictures of some of your work? Be sure you are looking at photo's or video of work their company has done and not a mass produced video from a parent company or parts distributor. Many times these videos are done in other parts of the country with different stones than are compatible to our local environment, and/or by different builders than are going to be doing your personal project. We are the sales team, designers, installers and service crew. So what we say we can do, we know we can do! Of course you want to know this right away! But let me ask you this.... Are they just throwing out a number that is sure to cover all their costs, no matter what. Are they going to give you what you want, or what they think you want? Can they show you right then on-the-spot exactly what you will be getting for your money? Or is their answer an itemized sheet with vague promises and no design layout? We take pictures, measurements, your ideas, an our expertise... put them all together and come back to your home with an exact knowledge of what we have to offer that meets your desires. We put this all in a "Proposal Packet" that we will refer to in the contract as to the way we will construct your water feature. We believe custom ponds begin with the customer! If you let us know your budgeted amount we will give you the best deal we can work out for you within that range. We have a few ways of cutting costs that do not affect the final product. After 17 years we have some cost effective ways to cut costs and we share that savings with our customers. Especially when it can save you money. Realistically, every single job is different: Is the electrical supply available; How far to the water source; What is the access to the job like; Do you already have re-usable & reliable parts; Are we upgrading or starting fresh; and so on. With an estimate given by us the largest cost is predominantly to cover the parts. We do not mark-up the parts and materials 25-50% that is typical, we figure time estimate and stand by it. We have cut our labor rates dramatically due to the recession! All parts have their Manufacturer's warranty. 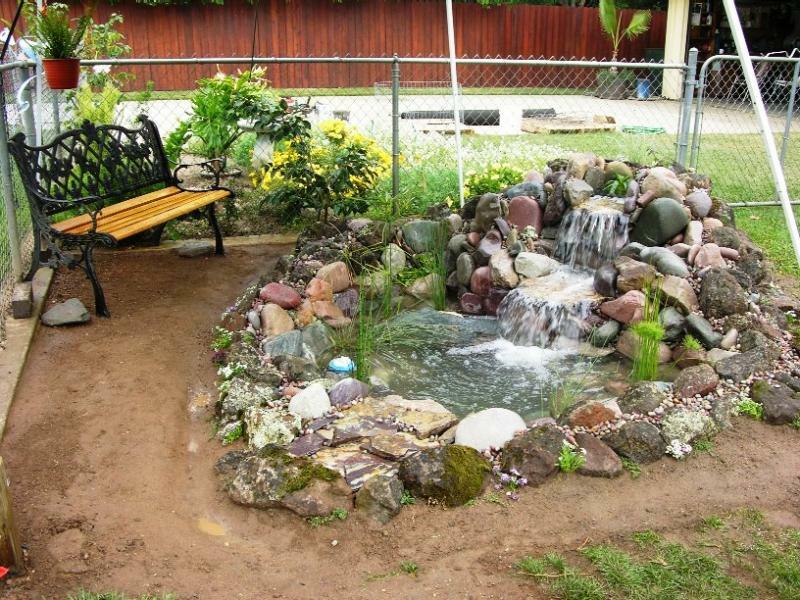 A pondless waterfall is generally much less expensive to build and more efficient to run. A water vase or natural stone that has been drilled for a fountain-like effect can also keep the costs down. Call us for some ideas! There is a great number of pond builders that are taught to "build-a-pond-in-a-day". IF you consider one of these pond builders I would want you to be sure they have; happy customers for you to call; a great deal of expertise; a trained and knowledgable Foreman on-site; know what kind of damage waivers you need to sign in advance; check out all the areas I have mentioned above; and do not sign on the first visit of the salesperson! This is not a time to want instant gratification. A water feature -- done right -- can add great value to your home. Aquascapes Designs,Inc. has done a national survey that states a good water feature can increase your home's value by twice the investment cost. One that is an eye-sore or high-maintenance is not going to add much to your home or to your time off to enjoy it! A water feature done the Bender Built way cannot be built in only one day! We care too much to build anything less than what we would have in our own yard. We offer structural integrity that we have not seen in any other ponds we have seen or have been to called for rebuilding. We do not allow man-made parts to show. We secure all rocks and even gravel so it doesn't wash away in the first strong rain & wind storm. We pride ourselves in what we do, so much so--we warranty our workmanship! Do the other guys do that? Not likely, often they often won't return calls or do repairs without a fee. 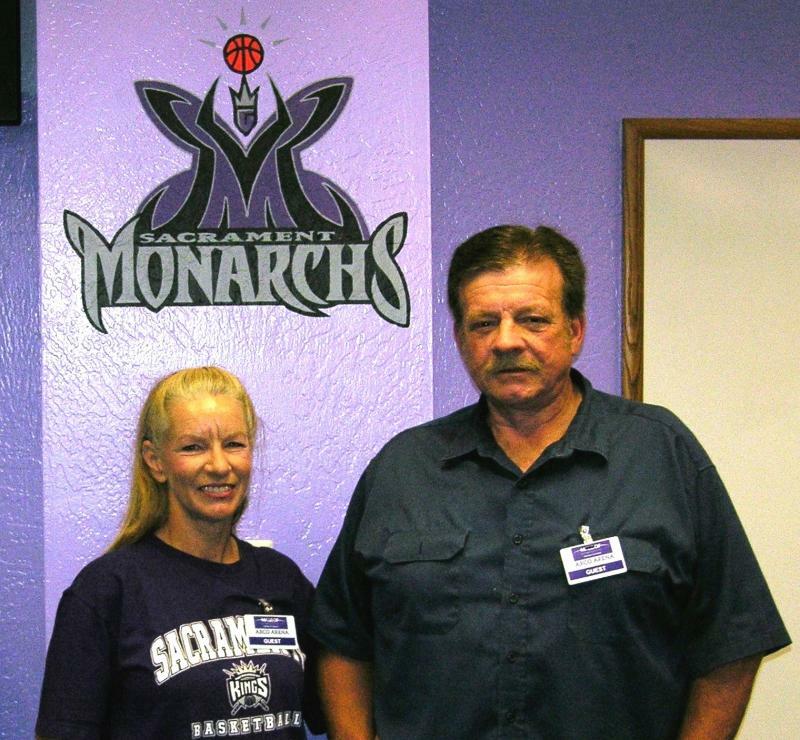 Debra & Bill could only imagine what we were goind to do to their favorite "get-away" corner. We needed to make a home for two little turtles and five goldfish. They needed good filtration and aeration and the plant-life had to be something the turtles would not consider as salad! Another factor in having a "turtle pond" is that the sides have to be steep enough with smooth rocks so they can't relocate to some hidding spot in the yard.